The panel comprised two members of the Omeka for Art Historians working group that I convened last year at CAA 2016, as an advisors for theme and plugin development geared to the needs of art historians and visual culturalists. 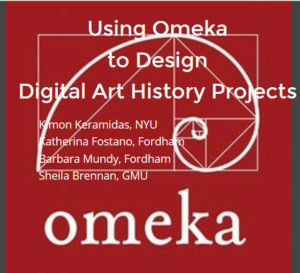 I am so impressed with the innovative pedagogy implemented at Fordham and NYU that Omeka has been able to facilitate. I discussed the working group’s goals, workflows, and products. All of this work was funded by a small development grant awarded by the Getty Foundation, because it was a direct outcome of ideas that Kimon and I developed following his guest lecture to RRCHNM’s Doing Digital Art History summer institute in 2014.